Corn-based ethanol is supposedly a green alternative to gasoline. The corn farming lobby certainly thinks so, anyway, and they’ve persuaded Congress to mandate (and subsidize) increased corn ethanol production through the year 2015. Using straight line amortization over 30 years of production at current fuel yields  results in ILUC emissions of 27 g CO2 per MJ…. 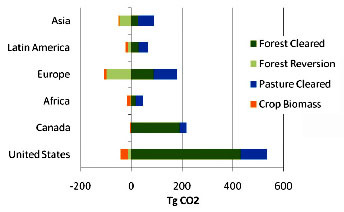 [A]dding our lower estimate of emissions to the direct emissions from typical US maize ethanol production (about 65 g CO2e per MJ) would nearly eliminate carbon benefit of this biofuel relative to typical gasoline (94-96 g per MJ). (Note: MJ = megajoule, a unit of energy.) In other words, even giving corn ethanol the maximum benefit of the doubt, it’s still no greener than gasoline: it releases about 92 grams of CO2 per megajoule of energy compared to 94-96 for gasoline. What’s more, if you assume a more reasonable 20-year amortization period, corn ethanol’s greenhouse gas emissions are even higher. And if you don’t assume that people eat less thanks to increased corn ethanol production, but instead just spend more on food, it goes up even more. Bottom line: corn ethanol is no greener than gasoline. In fact, it’s almost certainly less green, and at the very least, there’s no urgent need for the U.S. government to pay billions of dollars to subsidize its production. Too bad Iowa is the first state on the primary calendar every four years, isn’t it? 1No link yet. I’ll add one if and when it’s available. UPDATE: It’s not online yet, but the reference is BioScience, March 2010 / Vol. 60 No. 3.